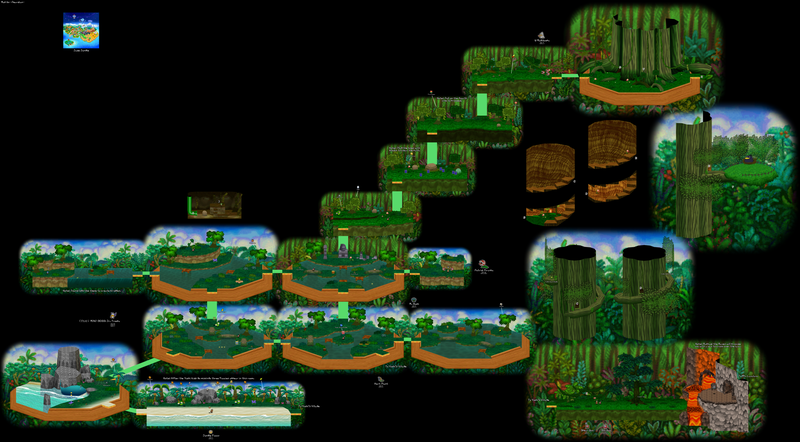 Located on Lavalava Island in the game Paper Mario, the Jade Jungle is the home of Raphael the Raven. Mario needs to travel through here to reach a better route to Mt. Lavalava and ends up at a huge tree. A hole in the tree leads to a room with a staircase carved out of the wall. At the top is a huge brach and Raphael the Raven's nest. Raphael and his fellow Ravens make a pulley contraption to ride over to the mouth of the volcano, where Mario must defeat the Lava Piranha inside and rescue the Star Spirit Misstar. 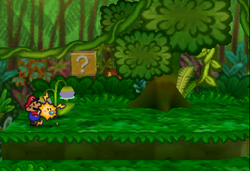 There are various exotic plants living in the jungle; some are beneficial to Mario, such as the Heart Plant, and others are hostile, such as the Hurt Plant. 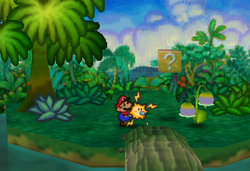 In Chapter 5 of Paper Mario, Mario's group and Kolorado first visit the part of Jade Jungle to the east of Yoshi's Village. They found that entrance to Mt. Lavalava is blocked by a gap filled with lava, and Kolorado suggests that they go back to the village to find clues to get there. Back in the village, the two find Yoshi's Village in chaos, learning that the Yoshi kids have sneaked into the jungles to the north of the village. Mario and his partners head there to find the Yoshi kids, rescuing Sushie on the way who then joins Mario's party. All the Yoshi kids saved, the Village Leader gives Mario the Jade Raven which allows Mario to proceed further in the jungle. Eventually Mario finds Raphael the Raven in a big tree, who then heads to the area to the east of Yoshi's Village and has his Ravens build a pulley for Mario to enter Mt. Lavalava. When Mt. 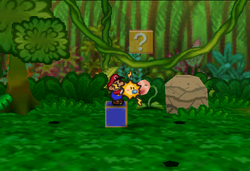 Lavalava erupts at the end of Chapter 5, the treasure chest containing the Volcano Vase is blown out and lands on the island in the jungle where Sushie was trapped. Mario needs to bring the vase to Kolorado for a Magical Seed, which is required to enter Chapter 6. It turns out that the Magical Seed is possessed by a Bub-ulb in the jungle, who has given it to Kolorado so Mario needs to get it from Kolorado instead of the Bub-ulb. At the end of the game, the island where Sushie was trapped and the Volcano Vase ended up is seen again, this time Sushie reading an invitation letter and Yoshis sleeping. 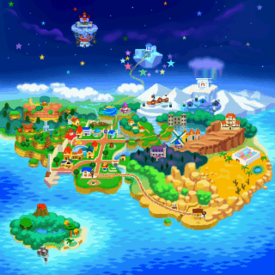 In the in-game map, the shore where Mario lands on the island and the beach between the shore and Yoshi's Village also belong to the Jade Jungle. Bub-ulb Found on an island one scene to the east of the entrance from the village. This Bub-ulb has no Magical Seed to offer since it has already given it to Kolorado; Mario needs to get it from Kolorado instead. It's a flower. I guess that's pretty obvious... It doesn't seem to move like an ordinary flower, though. Oh! A Bub-ulb. I don't know why it's growing here. It's a very strange flower, don't you think? This Seed... I bet it's something very important. Important to Bub-ulbs, anyway. Raphael the Raven Found in the big tree deep in the jungle. Helps Mario to get into Mt. Lavalava by building a pulley to cross the lava gap. He's Raphael the Raven, the guardian of this jungle. Look at the size of this guy! He's enormous! I bet there's nothing he can't do. Doesn't he seem trustworthy? He's a Raven. Ravens are short and chubby. They're pretty fluffy, too. And somewhat cuddly. And soft. This tattle is the same as one of the Ravens in Yoshi's Village. Quotation, however, differs. For enemy formations in Jade Jungle, see here. Star Piece On an island at the northeastern corner of the scene where Sushie is trapped. Underwater in the westernmost scene (where the blue Yoshi kid has been). Under a hidden panel in the fourth scene after the Raphael statue. Letter In the tree on the island at the northeastern corner of the Sushie scene. Ultra Stone Given by Raphael the Raven when asking for help. Happy Heart At the end of the big branch of the tree. Volcano Vase In a treasure chest from Mt. Lavalava after its eruption, one scene to the east of the Yoshi Village entrance scene. Power Quake In a badge block on an island at the center of the Yoshi Village entrance scene. Thunder Rage In a hidden block at the north corner of the Lavalava Island entrance scene. Fright Jar In the tree at the east of the scene to the north of the Lavalava Island scene. Stone Cap In a hidden block at the northwestern corner of the first scene after the Raphael statue. Egg In a tree in the first scene after the Raphael statue (can be gotten by pulling the vine). Volt Shroom In a hidden block near the leftmost block in the second scene after the Raphael statue. Fire Flower In the second tree in the third scene after the Raphael statue (can be gotten by pulling the vine). Mushroom In the last tree in the third scene after the Raphael statue (can be gotten by pulling the vine). Jammin' Jelly Behind the tree near the entrance to Mt. Lavalava. Thunder Rage Going one screen northeast from the island's westernmost shore with the Whale, Mario should use Sushie's field ability to swim from the southern dock to the one northwest of it. Then, he should follow the path east then north to find a Bellbell Plant and jump directly northwest of it to reveal the hidden ? Block. Stone Cap In the area one screen north of the Raven statue, Mario should go to the high elevated ground and jump directly southeast of the Bellbell Plant to reveal another hidden ? Block. Volt Shroom In the next area, Mario should use the westernmost blue movable block and push it east once and north once, then jump from it to reveal the hidden ? Block. Alternatively, Mario can also hit the hidden block from the ground with a Tornado Jump if he's equipped with the Ultra Boots. The jungle on Lavalava Island is lush and green. All sorts of rare plants grow here. Many kinds of rare plants grow in this lush jungle. Raphael the Raven lives at the top of a big tree here. This is where the whale comes and goes! Riding the whale here sure was fun! This is where all travelers first set foot on the beach of Lavalava Island. Beautiful water... Deep, lush jungles... A huge volcano... There's something for everyone! These beaches seem to go on forever, don't they? I've never seen some of these flowers. They're sure pretty! I should look for some shells if we have time later. I'm going to take flowers and shells back to Goombaria. She'll be happy...and she'll also be jealous. Ha ha ha! The entrance to the volcano is very near here. A green jungle, a massive volcano and red-hot, flowing lava. What a view! It probably wouldn't look so good if the lava were coming toward us. I can't imagine what those Yoshi kids were thinking... ...playing in a place like this... I'm not surprised, though. Kids! Always up to something! Besides, it's natural to want to go on an adventure. This is where we saved Sushie when she was caught up in that tree. Waa ha ha ha... I just can't help laughing when I remember that! Please don't tell her I laughed about it, Mario! We're in Jade Jungle. Quite a lot of water, huh? Since there's no bridge, we'll have to find another way to get around. That rotating flower down by the ledge? Locals call it a Spinning Flower. If you spin around on top of that flower, I hear that you can float upward. I bet only jungle explorers know about this hidden underground chamber. It's so dark in here I can't see a thing. For a jungle, there sure aren't many trees around. It gets brutally hot here whenever the sun shines directly on me. There's a big Raven's statue. You gotta figure... A big statue this deep in the jungle... I bet it's important. My, it's bright here! This must be on the outskirts of the jungle, huh? Incidentally, I have no idea how these Yoshi kids could come this deep into the jungle. Ooh...it's darker in here. The trees are much thicker and that bizarre ivy seems to be growing everywhere. What cool little fountains! Must be an underground spring.If we push these blocks over the holes to seal 'em, what'll happen to the water? Do you think it'll come out from another hole? Looks like some of the ivy is hanging off the trees here. I wonder what would happen if you pulled on it? What a huge tree! This definitely must be the biggest tree in Jade Jungle. How old must it be? It's so spacious in here! I can't believe we're inside a tree right now. Whoa! We're way up high! The jungle floor looks so tiny from here! Gulp! Have I mentioned before that I hate heights? I can't get over how huge the inside of this tree is! It's enormous! It's mammoth! And another thing, it's giant! This appears to be the nest of Raphael the Raven. He's the guardian of Jade Jungle. This nest is really sturdy. It won't budge, even if Raphael jumps up and down on the branch. This page was last edited on July 23, 2018, at 18:24.